A beautiful and elegant coffee table for the trendy design appetite. This article from the American Woodworker will describe in complete detail, the steps required to build this free woodworking plan. 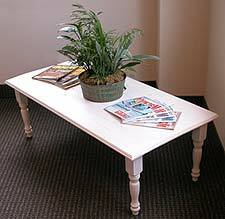 A customized coffee table is a beautiful addition to any home's d�cor. And, since it's customized, you can make the perfect decorative statement to match your style. I found a great project for the basement rec room that you won't mind the kids destroying. Don't get me wrong, it's a great free woodworking project, but the good thing is that you make it primarily from plywood wood. It should be very cheap and easy to build. It's going to be very sturdy as well. Grandpa is calling for 3/4" oak plywood for the project. Good luck moving that downstairs. He didn't include a material list or drawings, but it's a simply plan that you should be able to recreate from the description and pictures. A stylish, all-purpose table that goes great with a pair of sturdy stools. This versatile table is perfect for schoolwork, small projects and board games. Yes, it's a very advanced project, but that is only because of the stools. If you don't feel you can pull off the stools, give the table a try. The free woodworking plan for the table seems very simple and easy to build. Most bedside cabinets are a rather dull design, being simply a box-like shape. When the below bedside cabinets were designed, we wanted to subtly change the shape and feel of the cabinets, but without removing any of the functionality.